Do you want to have a unique wedding, different from everything else you see in the wedding mags and neutral Instagram feeds? Do you live life vibrantly, out loud, and full of color? Is your wardrobe grounded in hues that make you happy rather than neutrals, neutrals, neutrals? I'm sharing ways that you can avoid having a flat wedding and incorporate some color and LIFE into a day that's forever classified as "white." It is, after all, a nice day for a white wedding, but it's an even better day for a RAINBOW one! This post goes out to all my girls who grew up with Lisa Frank's rainbow leopard as their spirit animal, who gravitate towards the vibrant, and just appreciate the richness of life and all the hues it encapsulates! Now hear me, you don't have to go crazy, and there is certainly an important spot for timeless and elegant, but there's ALWAYS room for pops of fun in your details and decor! This is, after all, a STYLE, and if your style is not colorful, that's perfectly okay! Find a photographer that specializes in the light, airy, neutral palette that makes your heart sing. If you're a wild child and want all the bright hues, hit me up!! In this post, I'm sharing highlights from the most magical styled shoot (aka a "fake" wedding that showcases wedding vendors) that I've ever been blessed to be a part of! We will go through different elements of the day, dripped in color, to give you some ideas as to how your favorite shade can be present during your wedding, and even more importantly, how your personality can shine in a day steeped in tradition. This invitation suite by Penned by Alice features some pretty punchy pinks and unique papers and inks! 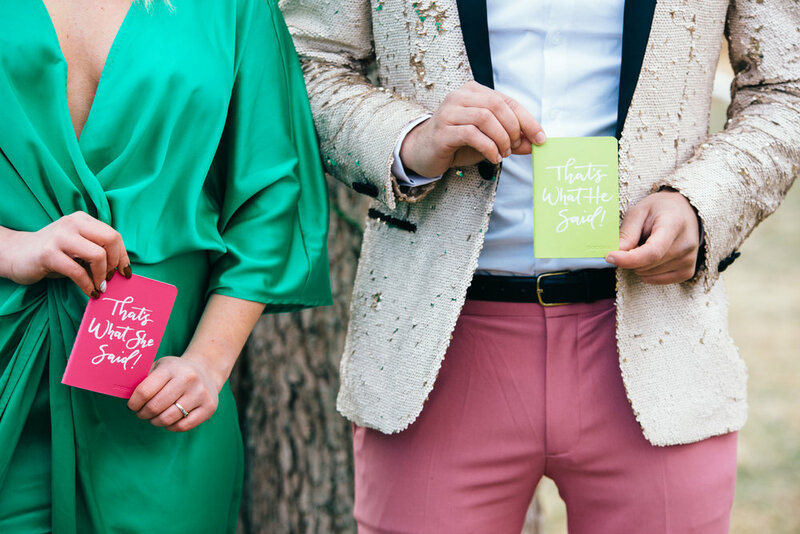 Invites are your guests first impression of your wedding style and theme, so carefully consider the message the papers, colors, textures, and wording says about you and the vibe you want! God's creation is full of color, and nowhere is this more evident in a gorgeous floral arrangement. If you want to keep things pretty classic and simple but still get sprinkles on your ice cream from time to time, here's where you can go crazy! A super talented florist like the amazing Kerry Patel can take your fav colors and make a spray that's a stunner. Desserts make everyone happy. Color makes everyone happy. See a correlation? 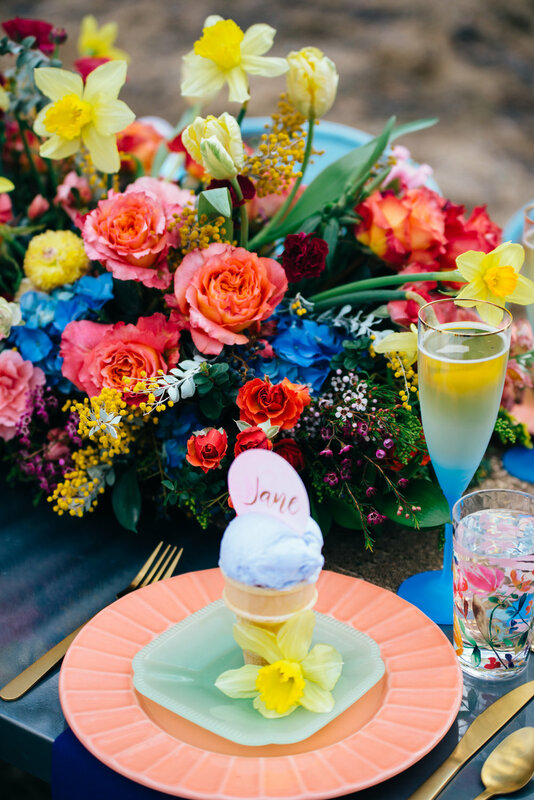 This is another place where you can cater to the fun and whimsical and play with color. Your cake photos will be a fun part of the day (smashing sugar in your hubby's face?! ), so make the cake itself fun too!! 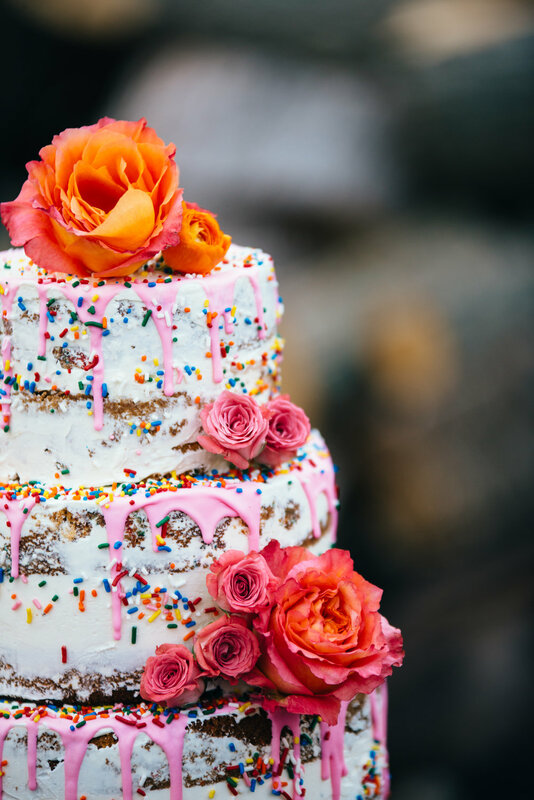 This awesome naked cake by Neverland Bake Shoppe features a baby pink drip, rainbow sprinkles, and more vibrant flowers! Not quite ready to make your cake rainbow-tactic? There's always the cake stand or even the INSIDE of the cake to add a pop of color or fun surprise! If you want to go maximum Lisa Frank, here's where you do it! The amazing, perfect, wonderful Jessica Oh Photography styled this shoot, and her use of balloons, confetti, streamers, and smoke bombs gave a loud and clear message that this is a unique wedding! 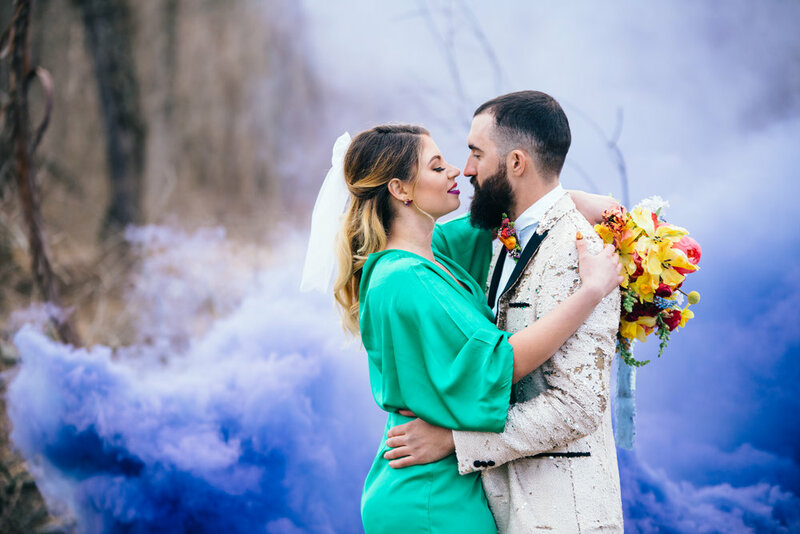 I guarantee you that if you tell your photographer you want to use colored smoke bombs, they will probably buy you a pony, I mean, cry with happiness. 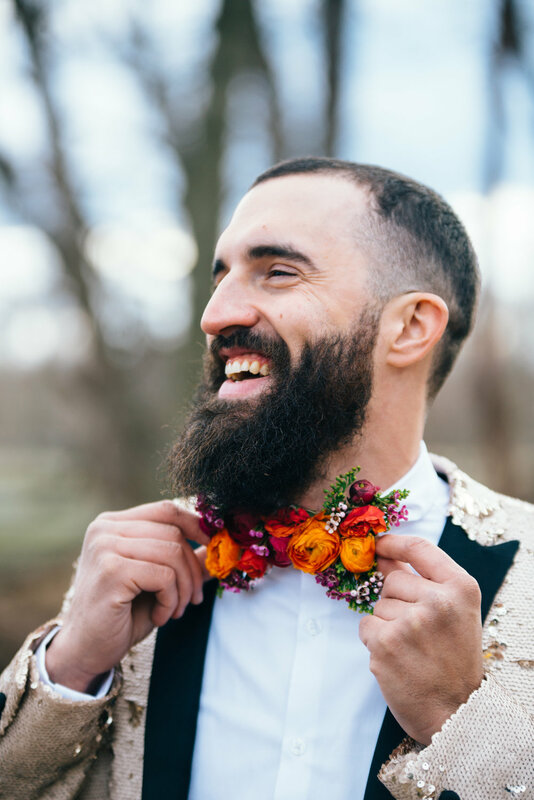 Of course, there's lots of other ways you can put personal touches on your big day, and I want to encourage you to never lose sight of that. Don't let tradition, outside pressure, cost, or especially wedding culture squash your creativity and enthusiasm. 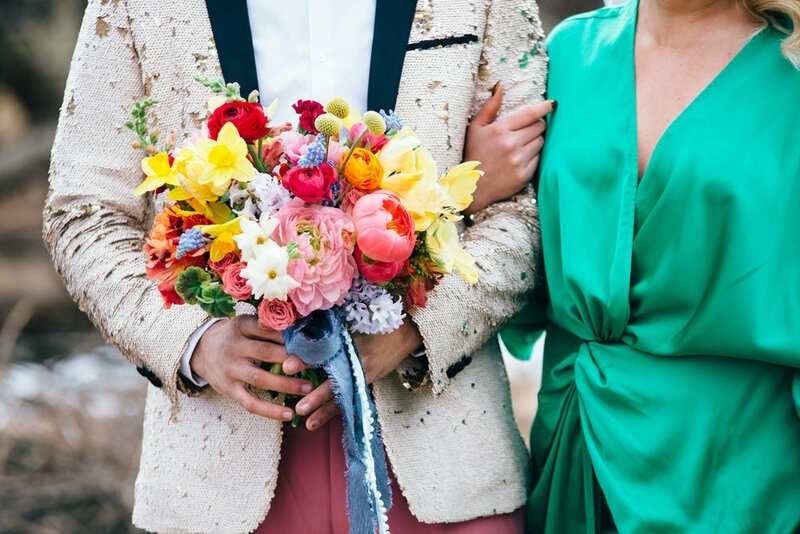 Weddings are all about YOU, so make them unmistakably YOU! Enjoy the process and let your imagination run wild!